Posted on June 12, 2016 by Mike Sonnenberg Posted in courthouses, Michigan Historical Markers, Uncategorized	. On 24 March 1836, the legislature passed an act organizing Livingston County and Howell was slated to become the County seat. This claim was vigorously opposed by a group from Brighton until the county buildings were actually erected 12 years later. The town was originally called Livingston Center because it was in the center of the county. The area was platted by Flavius Crane and and Edward Brooks, and they named it for Thomas Howell, a friend of Mr. Brooks, and the son of Judge Howell in Canandaigua N.Y.
Albert E. French designed the courthouse a two-and-a-half story brick and stone building. This edifice, completed in 1890, shows influence of Richardsonian architecture and has maintained many of its original Victorian furnishings. Peter and Maria Cowdry donated the land for the courthouse square with the provision that it revert to their heirs if no longer used for a courthouse. Local citizens presented the clock to the county as a gift. 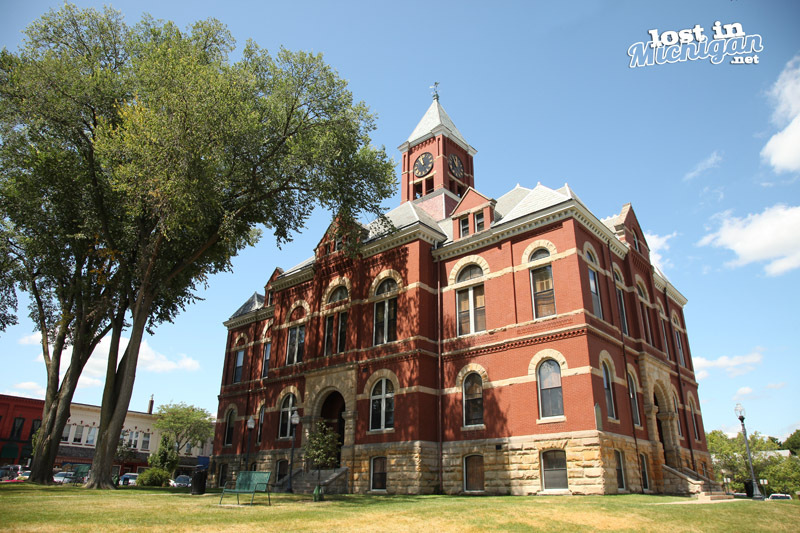 The people of Livingston County voted in 1976 to restore their courthouse which is an area landmark.